Titouan Puyo and Céline Guesdon are the undisputed champions of France, making a clean sweep of the national titles in St. Maxime this weekend. Titou and Celine both pulled off the double, winning Saturday’s course race before backing up a day later in the distance event. This caps off a big year for Titou, with the Starboard team rider enjoying a string of big results to move inside the top five on the world rankings leaderboard. France’s other top 10 world ranked paddler (and defending event champion), Arthur Arutkin, gave Titou the most resistance this weekend and bagged a pair of very solid runner-up finishes. 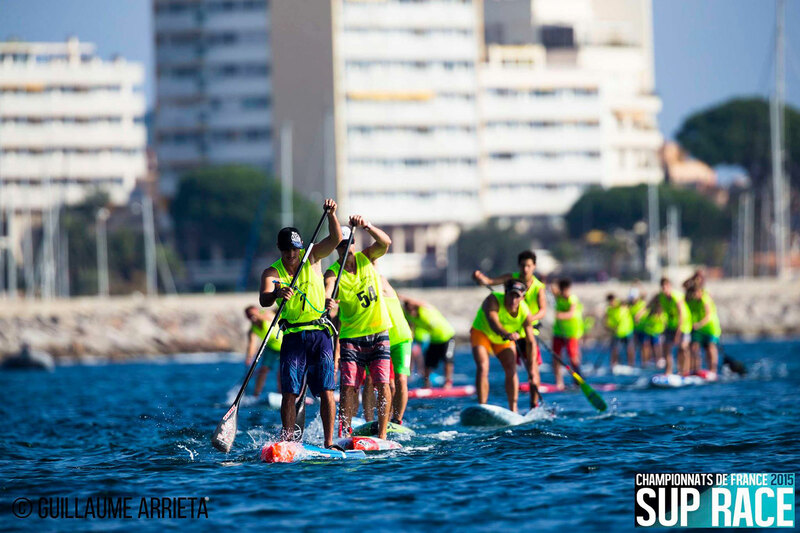 France is one of the strongest paddling nations on the planet and the talent pool runs deep, which made the 2015 French Championships an extremely competitive affair. The 2015 Championnats de France de SUP Race act as the main selection event for the French team that will compete at next year’s ISA Worlds. The winners today go a long way towards securing a spot, with the final lineup decided next month during France’s traditional ‘Selection Week’ event. Others to impress were rising star Martin Letourneur (3rd yesterday and 4th today), while Eric Terrien had something of a return to form after a horror year of results. French paddling stalwart Greg Closier had a great result on Saturday, coming home 4th in what was a vintage performance. It was also good to see the juniors stepping it up with strong performances this weekend: Martin Vitry was not only the champion junior, he was also very competitive in the open division, finishing 5th today after a 6th place finish in Saturday’s course race. Titou’s fellow New Caledonian, Clément Colmas, took out the under 15 division ahead of another name to watch in the future, Jules Langlois. The women’s podium was identical in each race, with Olivia Piana scoring a double runner-up while Amandine Chazot was third on both days. Looked like a great weekend in St. Maxime, with clear skies and relatively warm conditions (at least for this time of the year) setting up perfect conditions for racing. Though no doubt there was a sombre mood in the air, with Friday night’s horrific attacks in Paris casting a shadow over the event. Competitors observed a minute’s silence before the start of today’s competition. As always, check both the French Surfing Federation on Facebook and TotalSUP for full coverage. Here’s a great photo gallery from yesterday. Technical race and Long Distance winners, Titouan Puyo and Celine Guesdon were untouchables during the two days of the French National Sup Championships, held in Sainte-Maxime this week end, a tiny mediterranean village in the south east of France. Conditions were just perfect despite a very flat stretch of water and a quite small breeze. In full autumn, the temperature in this region was very favorable (20° celsius) on this sunny week end. Despite the terrorist attacks in Paris the day before, the annual championship was confirmed by the French Surfing Federation. In memory of the victims, an emotional minute of silence was fully observed by all the athletes, volunteers and officials on saturday. 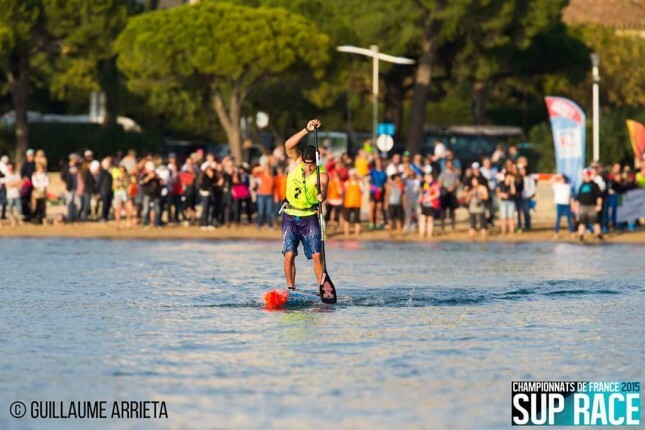 On one year after the Arthur Arutkin’s great doubled at Quiberon (Brittany), Titouan Puyo imitated his friend by removing both major titles of the sixth French championships of Sup race. Hardly of its four national titles (Open and U18 in 2014), Arutkin thus stayed twice in the trail of Puyo this year. The Nordist recognized he even on arrival as the New Caledonian had been above all year. Surprising Long Distance French champion in 2013, Puyo gets back his crown, once more in the Mediterranean Sea. On Sunday, the New Caledonian perfectly managed his business on a plan following the coast to the south of Ste Maxime, before going back on the island of the sandbank, to finish by a very slippery straight line of 3 km. At first by letting Arutkin make the job by attacking, then by controlling the pack to return towards the titleholder. In the bend of the island, Puyo then placed a high-powered attack which only Arutkin was able, one moment, to follow. Doubtless more freshly than his opponents at this end of season, because he did not wish to follow the Sup World Series this year, Puyo, ISA 2014 world champion of the speciality, confirms that he is french n.1 in 2015. Although dispossessed of its titles, Arutkin positions at the same level on the performance and the regularity. In any case, both rowers dominate the french SUP. Bow of hat to Eric Terrien who, as the last year, mounts the podium. At 34 years old, the captain of the French team and with times french, knew how to contain in the physical appearance and in the experience the ardour of the young Martin Letourneur (4th place) and Martin Vitry (5th place) to offer itself a new podium. Terrien is « the intruder » of the top 5 French riders compound of rowers from 18 to 24 years old, what demonstrates that French Sup has a great generation. French Champion of France titular on the Long Distance, Céline Guesdon keeps her crown and, especially, realizes too him doubled after her victory of the day before. In a new duel of Mediterranean, Guesdon has second time in 24 hours got the upper hand over Olivia Piana. Placed in its trail from the beginning, Piana tried for a long time to take over that prevented him the rhythm and the insurance of its strength of Guesdon. In a last uncertain quarter of race, Guesdon finally accelerated with the light wind in the back, to put down Piana. The return of Olivia Piana on Nationals after missing it last year and a long wound in the foot, allowed to judge the level both better French riders. At the end of this weekend, it is clear that Céline Guesdon is definitively n.1 French. A status which Piana is obviously going to try to push knock down in the coming years. Pulling in her trail of new heads as Amandine Chazot, champion of France 14 feet last month to Crozon, necessarily is to be kept a close watch. As Puyo and Guesdon, two other competitors made the doubled on these championships. Double champion of France titular to under 15 years, the New Caledonian Clément Colmas widely dominated his category of age both races of the weekend. Better, he offered the luxury to run with Open the long distance on Sunday and to take the overall 12th place ! Almost identical report for Martin Vitry, doubles champion in under 18 division and 5th of the Long Distance Open division. You said succession? “I am very satisfied to take back this title because it is the one who had allowed me to know me in the small world of the French SUP (victory in 2013, editor’s note). I had been left unsatisfied last year on a complicated race (at Quiberon, Brittany, editor’s note). I was really eager to take back this title. That of yesterday (Saturday) on the technical race, it is of the bonus! I had a little of evil over the beginning of the race today (sunday). 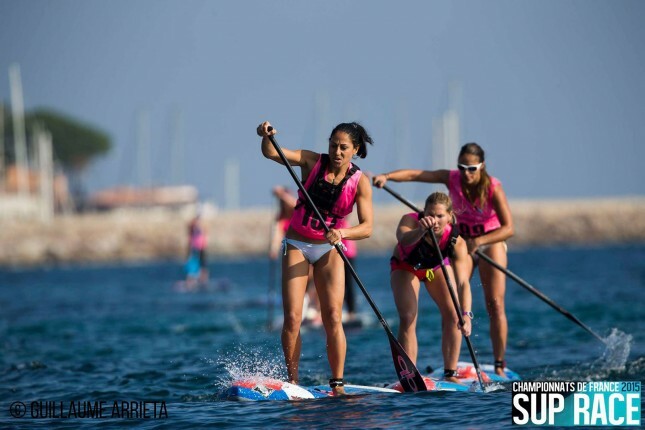 In brief: Titouan Puyo and Celine Guesdon have been crowned French Champions on day one of the national titles in St. Maxime. 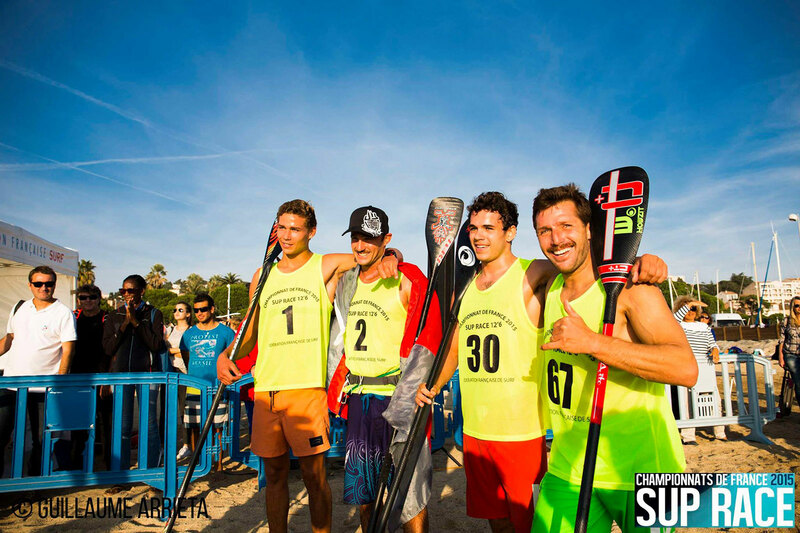 Titou took the title ahead of young guns Arthur Arutkin and Martin Letourneur, while French paddling stalwarts Greg Closier and Eric Terrien rounded out the top five. The field was whittled down to the final after two heats earlier in the day. Looks like conditions were perfect for a race. Despite it being late in the year it looked like St. Maxime was bathed in sunshine today though there was presumably a sombre mood in the air though given the tragic events in Paris overnight. The weekend started with the course race and will finish up tomorrow with the distance event. The 2015 French Championship will help decide the lineup of Team France for the 2016 ISA Worlds, which are due to be held in Fiji, Mexico, Argentina or China. The final selections for Team France will be decided after France’s traditional “Selection Week” event next month. Full results from today’s race coming soon. Check the French Surfing Federation on Facebook for rolling updates, photos and video. There are also more results, photos and videos over on TotalSUP. In brief: The 2015 French Championships are happening this weekend in St. Maxime. The winners of these national titles, aka the Championnats de France de SUP Race, Winners will go a long way towards earning a ticket for the 2016 ISA Worlds. Look out for the likes of Titouan Puyo, Arthur Arutkin, Eric Terrien, Arthur Daniel, Martin Letourneur, Florent Dode, Greg Closier, Martin Vitry, Vincent Verhoeven, Gaby Bachelet, Celine Guesdon, Olivia Piana and the rest of France’s finest to battle for the top spots. We’ll have results over the weekend… In the meantime I’ll leave you with this great shot from Michel Terrien. 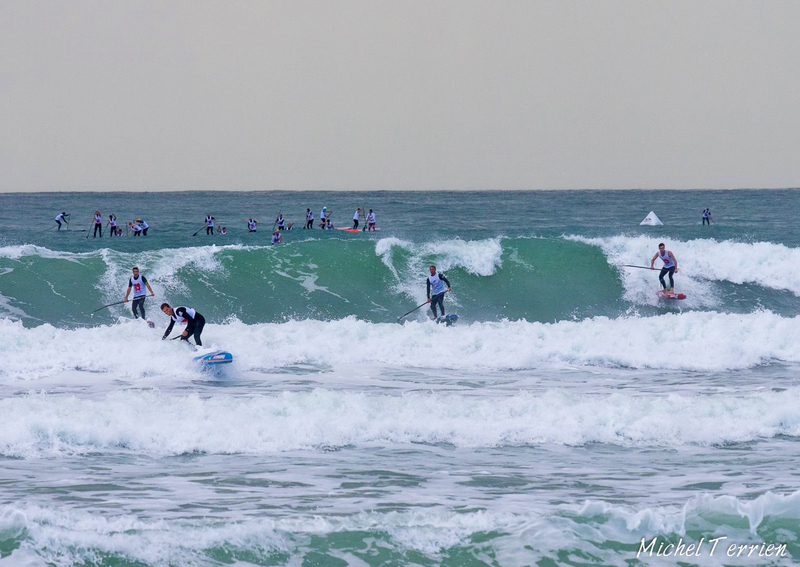 This was the 2014 French Championships over on the west coast. Unfortunately/fortunately (depending on who you ask), conditions won’t be anything like this on the weekend. 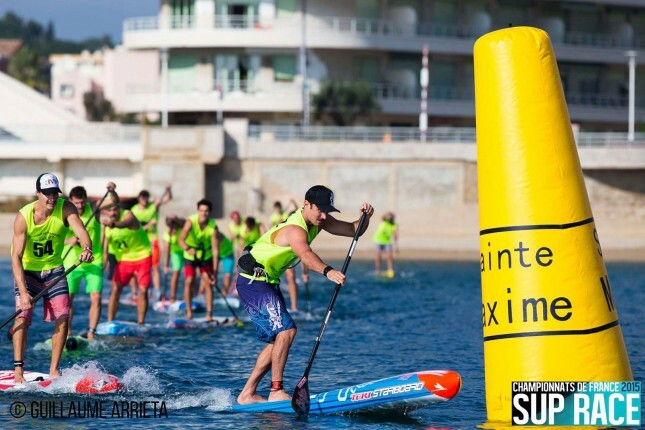 St. Maxime is over on the east coast (home of the SUP Race Cup).